With more than 1500 recognized tribal members, the United Red River Band (URRB) is the largest Native American organization in northeast Texas, with the majority of its members claiming residence in adjoining Lamar and Red River counties, just below the border with Oklahoma. It is estimated that as many as 40,000 certifiable descendants of Red River Cherokees are scattered throughout the United States, Mexico and Canada. The URRB is singularly incorporated to uphold and advance the interests of its people, not only within its sovereign district but wherever they may have settled. Having originally been forced from their historic homes and lands in Georgia, Tennessee and the Carolinas by the United States government, the Cherokee exodus and diaspora found the people — many of whom had built large houses and owned sprawling commercial businesses — required to live on the desolate plains land in the Southwest, primarily in Oklahoma and Arkansas. Subsequently, many Cherokees refused to continue on the forced march along the "Trail of Tears" and evaded the marshalling parties of the U.S. Army, settling instead in the verdant Red River Valley of the Texas Republic, which had only recently declared independence from Mexico. For nearly one-hundred years, the Red River Cherokees fought for recognition by the United States government, but were continually rebuked due to the tribe's refusal to accept demands that it be incorporated into the larger Cherokee Nation, based in Oklahoma. As the Red River Cherokee people consider themselves to be autonomous, self-regulating and sovereign — as is any and every other Native American tribe, regardless of their ancestral tribal affiliation or place of origin — the URRB represents a fiercely independent tribe that has endured despite being driven from lands it had settled and developed for hundreds (if not thousands) of years, and through generations of Cherokee family life, culture and history. The URRB does not and will not resort to the means that other indigenous Native American tribal organizations have in order to raise revenues. As such, the URRB will not permit gambling concerns to appropriate the name and heritage of the Red River Cherokees to operate casinos, bingo halls or poker parlors on tribal lands, regardless of the potential financial benefit. Instead, the URRB strives to create and develop Cherokee-owned businesses that serve the entire community, while providing educational opportunities for our young people, and additional health and security benefits for our older citizens. Prominent in the United Red River Band's official tribal seal is the image of Sequoyah (or Ssiquaya, as his name is phonetically written in Cherokee), the man who devised the Cherokee alphabet, or syllabary. Sequoyah, who was born around 1765, was a silversmith famed among his people. But more than that, he became iconic within the Cherokee Nation for devising a system of letters and symbols representing the various sounds that comprise the spoken Cherokee language, known as Tsalagi. Around 1809, Sequoyah began work to create a system of writing for the Cherokee language. After attempting to create a character for each word, Sequoyah decided to divide each word into syllables and create one character for each syllable. Utilizing characters from the Roman alphabet, with other characters adapted from other alphabets, he created 86 characters to represent the various spoken Cherokee syllables. The work of unlocking the complexity of the Cherokee tongue took Sequoyah twelve years to complete. At first, many of his fellow Cherokees had strong doubts as to the worthiness of Sequoyah's syllabary, so he taught his daughter to read and write using the new system. 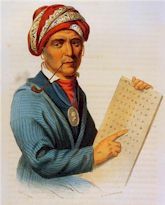 After proving the worthiness of his alphabet to Cherokees in his home area, Sequoyah presented the system to Cherokee leaders and medicine men only to be rebuked and accused of being possessed by evil spirits. However, Sequoyah continued to believe in the value of his invention, and the news of his written symbols quickly spread. Cherokees young and old soon began filling schools in order to learn the new language, which was recognized officially and adopted by the Cherokee Nation in 1825. Sequoyah has a singular connection with the Cherokee people of the Red River district. In the mid-1840s, late in his life, he journeyed with a group of other Cherokees through northeast Texas in an attempt to reunite the scattered members of the tribe that had settled outside of the main reservations in Oklahoma. Being in declining health due to advancing age, Sequoyah was unable to continue on the trek, and shortly thereafter passed away on what is now Red River tribal land. The United Red River Band honored this legendary humanitarian by officially placing his image on the tribal seal in 1958.